A couple of weeks ago I had a show lined up at Crazy Wisdom with Meeta Banerjee and myself. 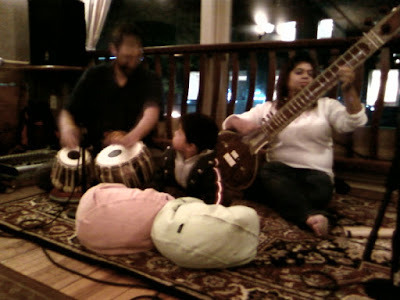 It was to be our usual Indian Classical music performance/workshop like we have done in the past. Crazy Wisdom does a lot of great advertising for their shows and since we have played there so often in the past, as soon as I told them yes on the dates, they had pictures and descriptions all printed up and posted online a moth before the show. I sent out a reminder of the show via my e-mail list a couple of weeks before, and made a poster to put up around town. It is a nice, streamlined operation. One problem though. Meeta, (who happens to be on my e-mail list), got my reminder and realized she had not put the date in her calendar. She called me and told me she could not make it. Yikes! asked Jon 'Atmaram' Plummer, (Ann Arbor Kirtan), to play some harmonium for the tabla ensemble and tampura for the vocalists. He said yes and I had full confidence the show would be a success. very excited and wanted to sit right next to them. His father said 'no, we have to go' and the boy started to get upset. The father then asked us how long we would be playing for and told his son that they would come back after dinner. Meeta promised the boy we would still be here and so they left. This night was very relaxed. Meeta Scott and I just played, improvised, and vamped on whatever came to mind. I did a little talking, but mostly we just played a bunch of stuff together and just had fun making music. After an hour or so the family came back and the little boy sat in a chair right next to me. 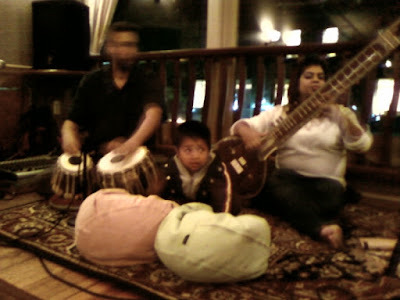 He started moving his fingers and pretending to play the tabla. crawled up on the stage area and sat, facing the crowd, right in front of Meeta. He pulled the beanbags close and began to play. Everyone had a good laugh. His mom was a little embarrassed, so she tried to pull him away. He didn't like that one bit. Maybe she thought it was too early in his career to start performing :) Here are some pictured Scott snapped with his phones camera, they are a little blurry, but they could very well be the first pictures of a great master performing for the first time!